Great events to inspire your spring photos! 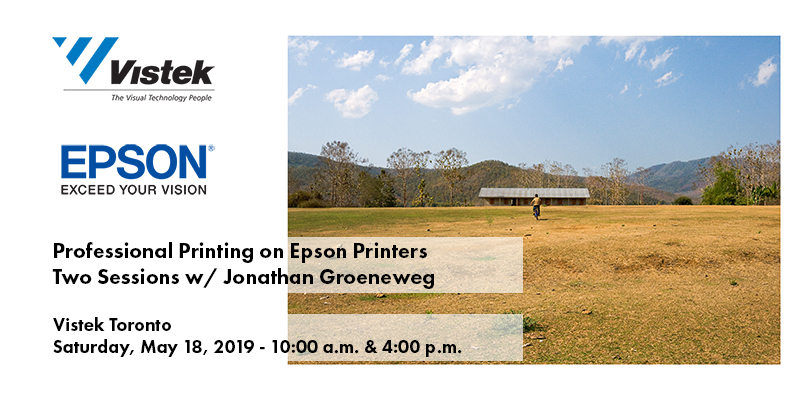 Throughout May, we’ll be hosting a series of seminars and workshops led by exceptional local talent, to help you understand the latest technology and refine your technique. 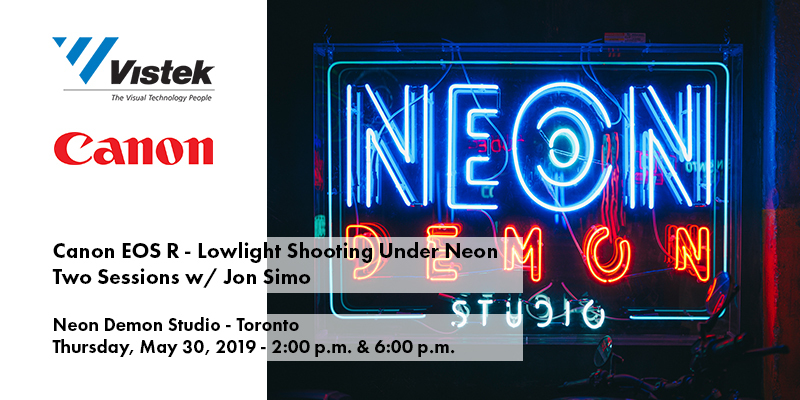 Registration for all events opens on April 23, 2019 at 11:00 a.m.
Neon-lit environments present photographers with unique challenges & opportunities. Here’s your chance to get some first-hand tips from someone who has mastered the technique, in his own self-created neon studio. 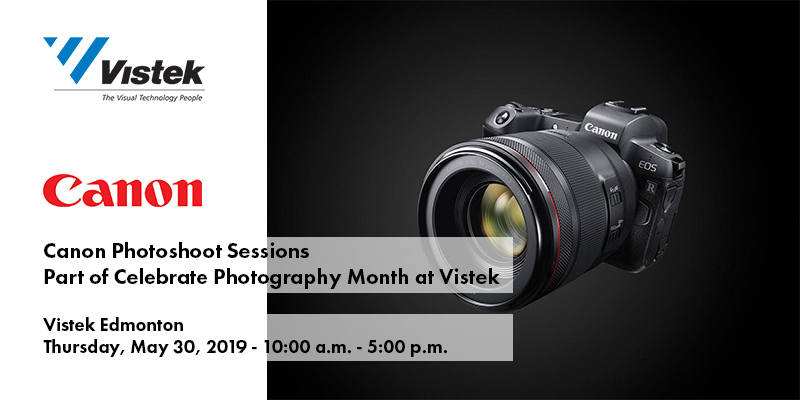 You’ll also have the opportunity to shoot with one of Canon’s latest DSLR's or the new EOS R.
DATE: May 11th 10:00 a.m. - 5:00 p.m.
Register for one of our May 11th, 15-minute photoshoot sessions. These short sessions will provide you with the opportunity to try out the latest Sony cameras, in our in-store studio setting, with a live model. There are a total 12 slots available throughout the day, and registration is limited to one person for one session. DATE: May 16th 10:00 a.m. - 5:00 p.m.
Register for one of our May 16th, 15-minute photoshoot sessions. 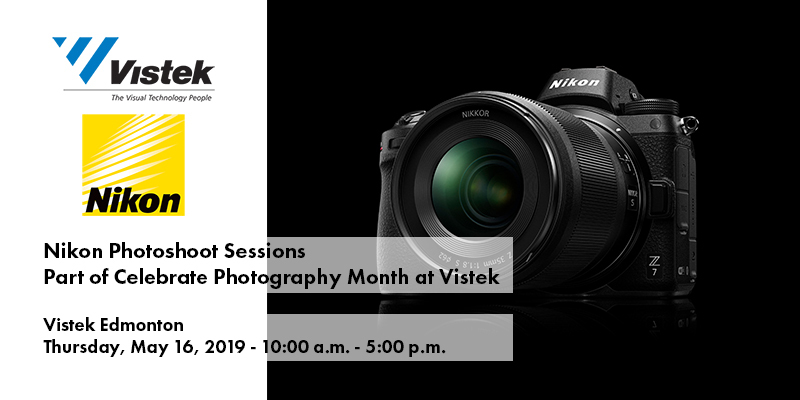 These short sessions will provide you with the opportunity to try out the latest Nikon cameras, in our in-store studio setting, with a live model. There are a total 12 slots available throughout the day, and registration is limited to one person for one session. DATE: May 21st 10:00 a.m. - 5:00 p.m.
Register for one of our May 21st, 15-minute photoshoot sessions. These short sessions will provide you with the opportunity to try out the latest Fujifilm cameras, in our in-store studio setting. There are a total 12 slots available throughout the day, and registration is limited to one person for one session. DATE: May 28th 10:00 a.m. - 5:00 p.m.
Register for one of our May 28th, 15-minute photoshoot sessions. These short sessions will provide you with the opportunity to try out the latest Canon cameras, in our in-store studio setting. There are a total 12 slots available throughout the day, and registration is limited to one person for one session. DATE: May 10th 10:00 a.m. - 5:00 p.m.
Register for one of our May 10th, 15-minute photoshoot sessions. These short sessions will provide you with the opportunity to try out the latest Sony cameras, in our in-store studio setting, with a live model. There are a total 12 slots available throughout the day, and registration is limited to one person for one session. DATE: May 17th 10:00 a.m. - 5:00 p.m.
Register for one of our May 17th, 15-minute photoshoot sessions. 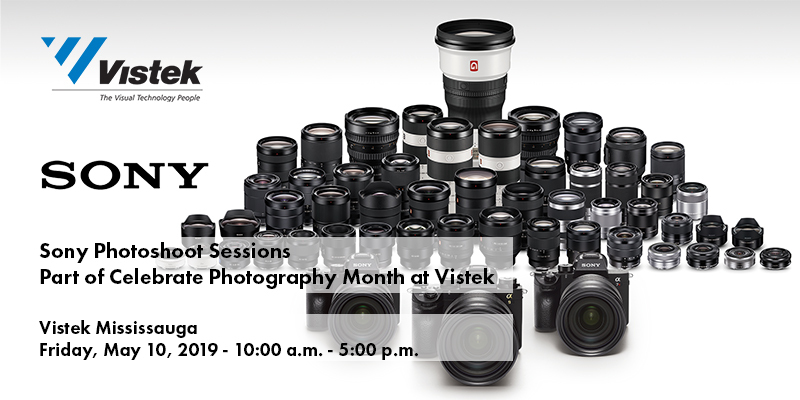 These short sessions will provide you with the opportunity to try out the latest Nikon cameras, in our in-store studio setting, with a live model. There are a total 12 slots available throughout the day, and registration is limited to one person for one session. DATE: May 8th 10:00 a.m. - 5:00 p.m.
Register for one of our May 8th, 15-minute photoshoot sessions. These short sessions will provide you with the opportunity to try out the latest Sony cameras, in our in-store studio setting, with a live model. There are a total 12 slots available throughout the day, and registration is limited to one person for one session. 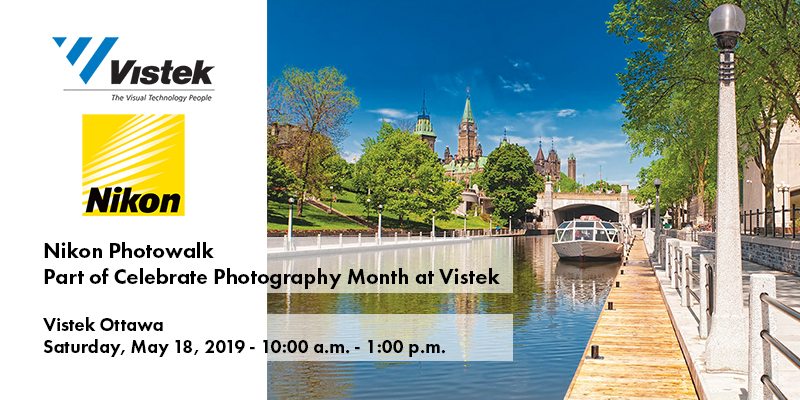 DATE: May 18th 10:00 a.m. - 5:00 p.m.
You’re invited to join Nikon Canada's Stéphane Bédard on a photowalk through beautiful downtown Ottawa. 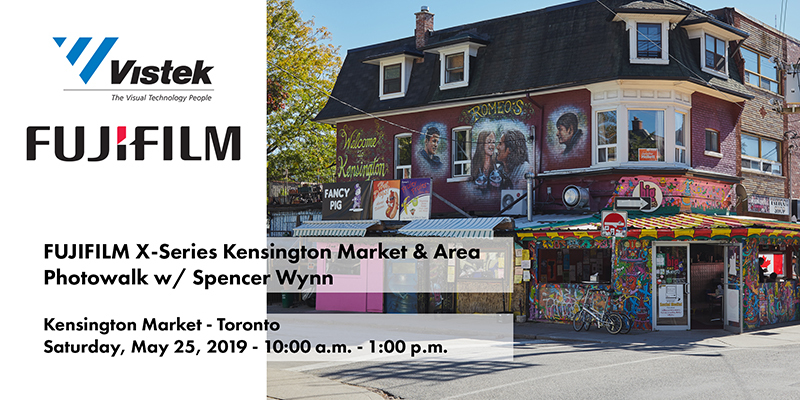 Departing from Vistek, you’ll venture to many of the city’s famous sites, such as the Rideau Canal, Market Area, Parliament buildings, National War Memorial, and Canadian Museum of Science. DATE: May 22nd 10:00 a.m. - 5:00 p.m.
Register for one of our May 22nd, 15-minute photoshoot sessions. These short sessions will provide you with the opportunity to try out the latest Fujifilm cameras, in our in-store studio setting. There are a total 12 slots available throughout the day, and registration is limited to one person for one session. DATE: May 30th 10:00 a.m. - 5:00 p.m.
Register for one of our May 30th, 15-minute photoshoot sessions. These short sessions will provide you with the opportunity to try out the latest Canon cameras, in our in-store studio setting. There are a total 12 slots available throughout the day, and registration is limited to one person for one session. DATE: May 14th 10:00 a.m. - 5:00 p.m.
Register for one of our May 14th, 15-minute photoshoot sessions. These short sessions will provide you with the opportunity to try out the latest Nikon cameras, in our in-store studio setting, with a live model. There are a total 12 slots available throughout the day, and registration is limited to one person for one session. DATE: May 24th 10:00 a.m. - 5:00 p.m.
Register for one of our May 24th, 15-minute photoshoot sessions. 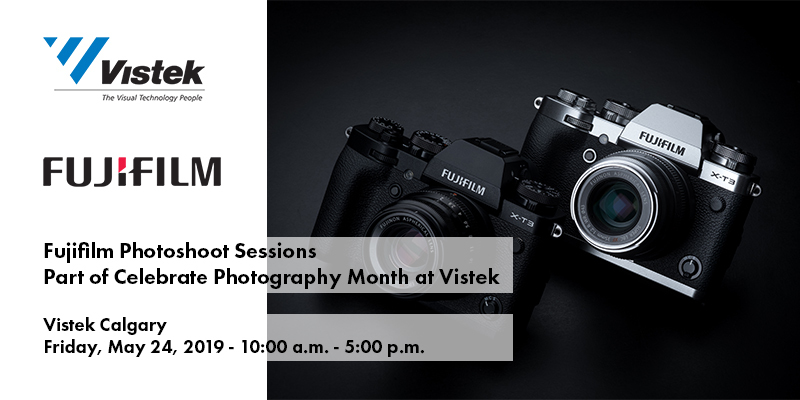 These short sessions will provide you with the opportunity to try out the latest Fujifilm cameras, in our in-store studio setting. There are a total 12 slots available throughout the day, and registration is limited to one person for one session. DATE: May 7th 10:00 a.m. - 5:00 p.m.
Register for one of our May 7th, 15-minute photoshoot sessions. These short sessions will provide you with the opportunity to try out the latest Sony cameras, in our in-store studio setting, with a live model. There are a total 12 slots available throughout the day, and registration is limited to one person for one session. DATE: May 25th 10:00 a.m. - 5:00 p.m.
Register for one of our May 25th, 15-minute photoshoot sessions. These short sessions will provide you with the opportunity to try out the latest Fujifilm cameras, in our in-store studio setting. There are a total 12 slots available throughout the day, and registration is limited to one person for one session.